Daimler’s Indian subsidiary Daimler India Commercial Vehicles (DICV) on March 2nd has officially presented its new range. As previously was reported, it will include trucks with GVW from 9 to 49 tons, which are based on Mitsubishi Fuso Canter (light and medium models) and Mercedes-Benz Axor (heavy models). 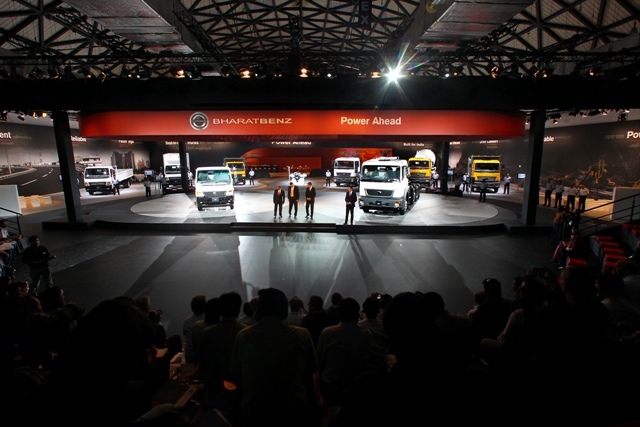 The model range of 17 trucks will be completed by 2014. The 160-hectare site will be put into operation in a few weeks, and production trials of engines and transmissions have already begun. And now, let's talk about the new trucks. Light and medium range is presented by the model 914 with GVW of 9600 kg and 1214 with GVW of 11,990 kg. Both are based on Mitsubishi Fuso Canter truck and equipped with 100 kW (140 hp) engine and 6-speed manual gearbox. The third model in this range is the 1217 tipper with GVW of 13000 kg. It received a more powerful 170-hp engine. An interesting and ugly feature of these models is the front underride guard, which is not covered with a bumper, and sticking out beneath of it. And if the lighter models thanks to the smaller wheel is almost imperceptibly, then the models 1214 and 1217 looks like a railroad locomotive with a bump! The heavy range created on the chassis of Mercedes-Benz Axor looks much more harmoniously, although it has the same wacky underride guard under the front bumper. The range includes 3-axle chassis and tipper 2523 with GVW of 25,000 kg, 4-axle chassis 3123 with GVW of 31,000 kg, 4-axle tipper 3128 with GVW of 31,000 kg and 3-axle tractor 4928 with a GCW of 49 tonnes. The first two models are equipped with an engine capacity of 170 kW (230 hp) and six-speed gearbox, and the last two with an engine capacity of 205 kW (280 hp) and 9-speed gearbox.